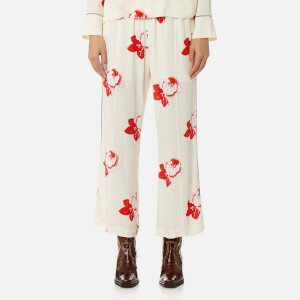 Women's wide leg trousers from Ganni. Cut from pure denim, the 'Bluebell' jeans are cut with an exaggerated wide leg and feature a classic button fastening with zip fly. Equipped with two side seam pockets and two rear pockets. Finished with tonal topstitching for a clean silhouette and a flattering V-shaped rear yoke.